Networking -Work that room, baby! I often speak at networking events and so I am writing this blog in mind of those who are perhaps a little anxious or don’t know what to expect at networking meetings. I am really excited about a new networking event, the Hour of Power, taking place next month so I would like to make sure that everyone is happy to come along and work that room, baby! Why bother with networking? If you’re looking to succeed and sell to other people there will always be a need to connect with others. Yes, networking involves “work” but this can get to a stage, with my 4 tips below, where it becomes an every day habit that isn’t really “work”! How do you feel when you attend a networking event? What do think when you enter the room? Who do you approach first? Where do you stand? Do you talk to many people or just a few? Networking can sometimes bring back those feelings of being at school –a little bit of excitement that is overwhelmed by the anxiety of putting your foot in your mouth! It doesn’t have to be that way! You’re no longer a teenager, so GET RID of those niggling doubts and take control of what you want to happen when networking in a room full of possibilities and opportunities. So, let’s start WORKING on those things so you can leave a networking event with optimism and a sense of achievement. So, how can you reduce the “work” element of networking so that it becomes something you are so successful at that you forget there is any “work” involved? Think of yourself as an actor or actress on stage in the local theatre where you see a mix of familiar faces as well as strangers. Preparation is key- fail to prepare and you prepare to fail. So here are the ultimate 4 steps on working that room, baby! Act. Walk up to the mirror and look at the way you hold your shoulders and head. Study your body language as you walk around or stand in one place. Do you exude confidence? I’m not asking you to shimmy along like Beyoncé or to stomp around like Sylvester Stallone, instead find the natural confident you – lift your shoulders back and hold your head up high to notice an instant change! Practise your stance and your look until you see the epitome of confidence looking back at you; and…smile! Put on your clothes. This does not mean that you’ve been naked for the whole of step no.1!! Instead, rehearse in the clothes that you will wear. What do your clothes say about you? When we meet people for the first time we take in what they physically look like and make a snap judgement – it’s not to say that that judgement is right but is the first and lasting impression! What will people think of your clothes, your shoes and your hair? This first impression gives others signals as to what our style is – or not – so think about the signals you send out. Look at your image and… smile! Practise your lines. Have a number of good “opening lines” to break the ice. Get rid of all fears of rejection and change your mind set. If you’ve turned up, then you’ve conquered the biggest risk of rejection, so get rid of those others fears and start thinking about all the rewards you can get from meeting people and discussing business. Have a way of introducing yourself that makes a lasting positive impression. Never be afraid to introduce yourself or to ask others their name when you join a conversation. Everyone is there to network so it is expected that people will walk up to others and say hello. Rehearse what else you will talk about – what will you say about yourself and your work? What will you ask others? Don’t think of it as an interview but as a chat that you are having with your friends in a workplace setting – be professional, polite and friendly. Sometimes those pesky nerves can get in the way of our personality shining through. So bust those nervous feelings right now and… smile! Be interested. It’s not all about being interesting! Ask powerful questions that mean you want to hear what others are saying. For example:What social media platforms do you use so I can find out a bit more about you/ your company? Can you tell me more about ___________? What do you mean by_______? Pay genuine compliments. Exchange business cards, thank people for speaking to you and… smile! 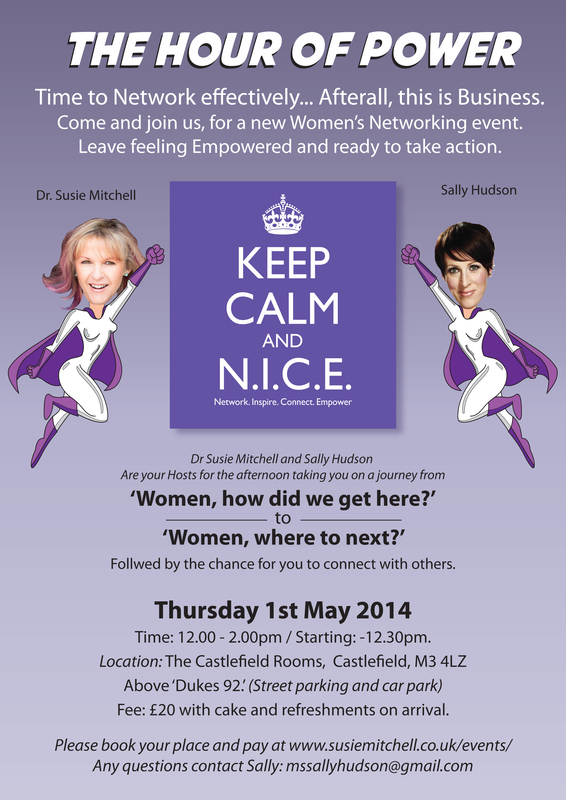 Pease do come along to Hour of Power – a women’s networking on Thursday 1st May 12:00 – 2:00pm with Sally Hudson at the Castlefield Rooms, Castlefield, M3 4 LZ. Book and pay for your place here. Look forward to meeting you. Please do come and say hello, particularly if it is your first time networking. If you’ve got any tips to share please leave a comment. How To Survive As A Business Networking Newbie! If you’re just starting out in business, you’ve probably already been told by a number of people that Business Networking is an essential activity to get involved in. It’s a great piece of advice and, even though it might fill you with absolute dread, it will provide a huge number of business contacts. Whilst not all of these will be directly relevant to you and your own business, referrals to third parties happen all the time and this really is the whole point to getting involved in Business Networking. One of things I knew I had to face up to when starting out on my own was the fact that I’d have to put myself out and about on the Business Networking circuit. I can tell you that, out of all the hurdles associated with setting up a new business, the Networking hurdle was my most feared. I’m not a natural Sales Person but I am a natural talker – and the more events I’ve attended, the more I’ve realised that being able to talk is the only skill you need. Oh yes, and a stack of business cards! Even if you’re feeling completely overwhelmed, wear a smile. It will attract other people towards you and instantly boost your confidence. Approach other people standing on their own at Business Networking Events. Remember – you’re not the only one feeling awkward. Plenty of others are more than likely to be as nervous as you are. It gives the impression that you’re confident and comfortable in the situation and you definitely mean business. Always try and ask about your new contact first. This will demonstrate that you’re not a selfish Networker because you’re showing that you’re more interested in the other person than in talking about yourself. Essential Networking Etiquette! Even if you’re talking to someone whose business is of no direct relevance to your own, appreciate that you’re all there for the same reason. Who knows – you might know someone….. who knows someone ….. who needs their details. Keep your own business statement brief. Accompany your verbal statement with your business card and direct people to your website for more detailed information. Keeping it brief at the beginning enables others to ask specific questions which you can then answer in as much depth as is required. You will make a good impression with many new contacts because they remember your friendly personality and honesty first and foremost. Acknowledge the contacts you’ve made. Always follow a Networking event by sending a brief two-line email to every contact you’ve made along the following lines: “nice to meet you, added your details to my database, hope to see you at future events”. Nothing more is needed – unless, of course, potential business was discussed at the event prompting a more detailed message or even a phone call. So, all in all, it doesn’t have to be that scary. By implementing some – if not all – of the above tips, you can actually look forward to attending future Networking events free from all those unnecessary anxieties. Related Post: Business Networking and Building Relationships. 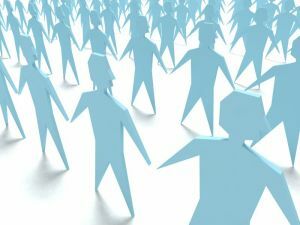 There are many Business Networking groups, you have to find a network that suits you and your business, here is a small list to get you started. First Impressions Last – Business Networking for Success! First impressions matter! When we meet someone, everything about us needs to be the best it can be! We need to set ourselves up to win, to hit the targets we set and achieve our desired outcome. Our mental state is so important – there is no point in connecting with someone if we have those ‘little gremlins’ in our heads thinking about “What if I am rejected” or “I am not worthy enough to meet these people”. Do not kid yourself, when you meet someone, they will pick up on vibes we all give off – positive or negative. Make sure that when you meet someone all they sense is confidence and the desire to know more from you! Trust is built in the instant unconscious rapport connection – or not! Even though first impressions are not always correct, it is what stays in the mind of the other person until corrected! Prepare before an event – set a specific strategy as to what you fully want to achieve before an event. Maximise your opportunities, market yourself in the best possible way. Practice your pitch and work out which would be the most powerful questions to ask. WOW! Them to Woo them! – Give value first! The power of building the strongest business relationships you can have is to have other people wanting to connect with you! 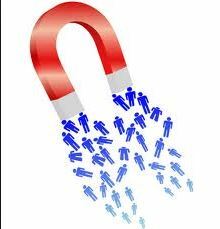 Be a People magnet – Master the art of turning contacts into relationships. Establish common ground to first connect, as the trust builds, the relationship will move to a deeper level. Success will ultimately depend upon your rapport skills and your networking strategy. Remember, play to your strengths, maximise all the skills you have and know your outcome and stay positive! Let me know how you have improved your networking strategy and what results have come of it! Can you survive in business today without doing some form of business networking? The old say comes to mind “it’s not what you, know but who you know”. I know my success in business IS due to the relationships I have built with colleagues, strategic partners and clients. I have joined various networking groups in the past and attended many events, both industry specific and open groups, if you go in with an open mind and be open to opportunities, you just never know who you’re going to meet! I have been rewarded both in financial and non-monetery terms, I get so much more from networking than just business referrals, although that’s why we all go in the first place! People who understand networking will tell you “it works, just try it!”. Here are some tips so you approach business networking the right way! Be Patient, it takes time to build relationships. 4N’s ethos is MEET-LIKE-KNOW-TRUST, until you have reached the trust stage people are unlikely to refer you to their valued clients. Of course there are cases where a visitor has attended a meeting and picked up a 20k contract but this isn’t the norm. So how long does it take? This depends on your personality, your business and the groups/events you attend. If networking isn’t working for you do not question networking, ask yourself what you are doing wrong? Go in with the attitude ‘who can I help today?’ not ‘who can buy my products?’. I have witnessed people walk into a networking events and just try to sell to the people in the room, they are missing the bigger picture. Once people trust you, they become your extended sales force, so much more powerful than a one of sale! Go beyond your industry and never assume anything! Connect with people on a variety of levels from a wide range of industries, you can never second guess who people know and how they could help you. Develop the habit of introducing people. Connecting like-minded people is a powerful way to enhance your network. Stealing the BNI networking groups phrase ‘Givers Gain’! Follow up! Don’t forget to follow-up after networking events to deepen relationships. Share any networking tips below! You can join me at the 4Networking Group Nantwich on Thursday 27th September, the group meets every 2 weeks be great to see you along!